One year ago today, out swam Baby into a pool of warm water and a room of worn-out, overwhelmed, awestruck women. It’s a baby! We are dumbfounded like we had no idea. Being at the very first breath of a life has that effect. It’s weird enough that matter reproduces matter, but that a real person appears, a formative social being? Every single time: tremulous incredulity. The baby, likewise, is astonished, having no experience yet of the potential for boredom that some people find within the spectrum of existence. This is the very beginning of learning to perceive: making a relationship between light and shade, between presence and noise, between comfort and discomfort. Baby aged one year is pleased to be in the park, with toys and cake and sandwiches and people she recognizes as part of her life. She closes her eyes when the sky is too full of light. Tips her head when the breeze lifts her hair. Folded cardboard has words and pictures, like books, so she reads them. Her interpretation of a barking dog is based on the jaw movement rather than the sound, unless she has confused the word ‘dog’ with the words ‘hungry goldfish.’ Placed in front of the cake; which we see as a home baked beauty from the kitchen of Aunty Kirsty; I am not sure of her understanding. 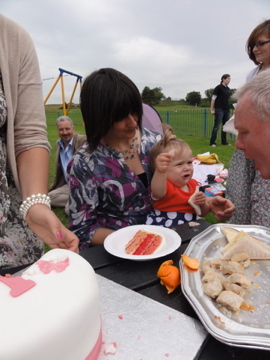 Cake she has met before, but not on a play park bench. She explores the situation by touch. Her fingers seem to recognize an acceptable object to grab and eat. Taste confirms that this is what delicious looks like. Her expectations of life are made good. Awe! Happy first birthday, baby! Such an interesting post full of insight. :-) Lovely! So nice... A Happy Birthday! That took me back to when mine had their first birthdays. 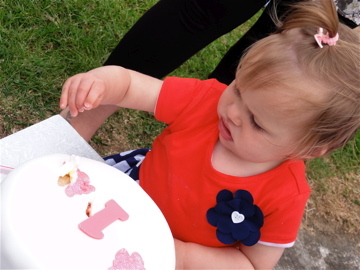 Cake was definitely something to be enjoyed in the exploration. Your words have captured the mystery and perfection of babies.